According to government data from 2016, India's under-5 mortality rate (U5MR) i.e. children per 1000, dying before age five, is 39. That is, nearly a million children in India die each year before their fifth birthday. Since I moved into the world of public health, I have been amazed by two things: one, the enormity of problems and two, the fact that solutions are known. According to government data from 2016 , India's under-5 mortality rate (U5MR) i.e. children per 1000, dying before age five, is 39. That is, nearly a million children in India die each year before their fifth birthday. Yes, India has made progress. The U-5 MR was 122.5 in 1992. However, U5MR of countries typically considered as peers - Brazil, Russia, China - is less than half of India's. Even smaller South Asian nations like Sri Lanka, Bangladesh and Nepal perform better. Question 1 - Within a child's first five years, when are most deaths happening? We can look at child death data, per 1000 births, for three key timeframes - a) Birth to 28 days (Neonatal mortality rate), b) Before age 1 (Infant mortality rate), c) Before age 5 (U5MR). India's U5MR, Infant Mortality Rate and Neonatal Mortality Rate were 39, 34 and 25.4 respectively in 2016. This means 25.4 of 39 under-5 child deaths, i.e. ~65%, occur in the first 28 days itself. ~22% occur in the period from 28 days to 1 year, and ~13% between the child's first and fifth birthdays. The implication is that newborns and infants are the most vulnerable; if they survive the crucial first year of their lives, their likelihood of surviving the next four years and beyond is much higher. Question 2 then is, what is causing these deaths? In the first 28 days, most child deaths in India are caused by three factors - premature births (35%), infections viz., pneumonia, sepsis (31%) and birth asphyxia (20%). After this period, pneumonia and diarrhea are the largest causes of death, causing 15% and 12% respectively of child deaths under age 5. Another common thread is malnutrition, which is a contributory factor to 33% of child deaths in this period. The tragedy (and opportunity) is that most of these deaths are preventable through known solutions. In addition to reducing morbidity, preventive health has economic benefits. The Global Nutrition Report estimates that malnutrition alone causes economic losses amounting to 11% of annual Gross Domestic Product (GDP) in Africa and Asia. Preventive health is often limited by the fact that it does not generate visible outcomes instantly. But in the long run, it is essential for India to invest in preventive health to reap its much-touted 'demographic dividend'. Consider pneumonia, for example. It is responsible for ~15% of child deaths and simple actions like proper handwashing, ensuring personal hygiene of mother, child and surroundings goes a long way towards preventing it. Preventing child deaths involves a continuum of care. Health and nutrition of adolescent girls sets the base for healthy pregnancy and outcomes. Avoiding pregnancies in young age and birth spacing are important. Critical to preventing child deaths is focusing health and nutrition efforts in the golden window of the 1000-day period starting from a child's conception till the child turns two. When women conceive, it is important that they are registered early for Ante Natal Care (ANC) and receive at a minimum, four such checks during their pregnancy. Only 44.8% and 66.4% of women in rural and urban India respectively receive four checks. Nutrition is of utmost importance during pregnancy to ensure the health of mother and child. Families must be counselled to ensure that deliveries occur only in recognized hospitals. Improving these parameters requires strengthening the hands of frontline health and nutrition workers in villages. Key remains in transforming mothers and family members to become active and aware consumers who demand these services from the government system. Next is the delivery stage. Health facilities especially in rural areas are often mismanaged, with deliveries handled by inadequately trained and overburdened nurses. Strengthening labour room systems and working with nurses to improve knowledge, skills and confidence yields results. Possibility of infection is reduced, complications are managed better, breastfeeding is initiated early, initial vaccinations are administered, and the child is kept warm. When mother and child return home, the baton is returned to the frontline workers. They need capacity building for conducting more effective home visits, offering counselling and care. They need to use granular data to ensure no child is missed in routine immunization and children faltering on growth indices are tracked and managed promptly. Involvement of representatives from local government is essential to ensure availability of clean, potable water and sanitation facilities. These actions mitigate likelihood of diseases like diarrhea, prevent infections while improving nutrition. 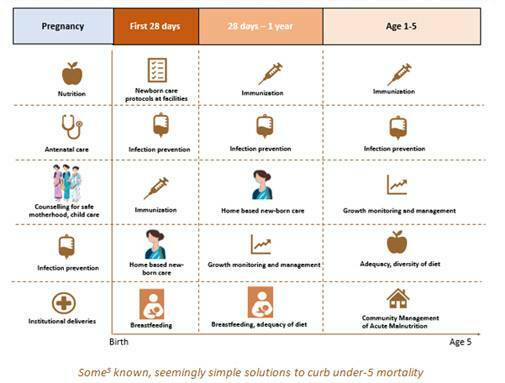 Such known solutions which seem simple but are tough to implement at scale in field conditions can negate several major causes of child death. Preventive health, particularly in rural areas, does not get the resources or attention that it deserves. The burden is currently borne largely by the Government and it continues to do its best. Data shows that the health sector receives significantly lower funds than other sectors like education and skill development. While granular data isn't available, indicative examples show health sector spend to be focused on infrastructure development, medical camps and Mobile Medical Units (MMUs). Each of these are undoubtedly worthy causes, requiring attention. But the implication is that preventive health isn't on the radar of most major corporate givers. Apart from building hospitals, which offer great opportunity to donors and politicians to show as tangible forms of development, CSR funds also need to be directed towards efforts which enable mothers and children to stay nourished, healthy and not require regular hospital visits to survive. I call upon CSR leaders to lead the way by investing in preventive public health and nutrition. A healthy and prosperous nation begins with its children. U5MR is a reflection of the state of development of a nation. Seemingly simple steps - strengthening frontline workers, better management and training at facilities, involving the community and local government can save lives and radically improve health and nutrition outcomes. Piyush Mehra is the CEO, Antara Foundation. He has worked in management consulting with Arthur D Little and KPMG.